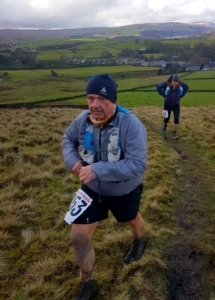 The Haworth Hobble is a 32 mile ultra run with about 4400ft of climb, this would be my first attempt and JD’s sixteenth. A low-key event that I probably wouldn’t have known about if it wasn’t for JD. 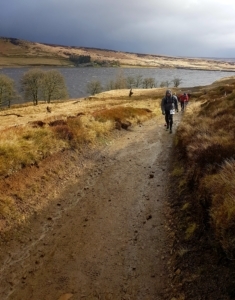 Previously known as the Wuthering Hike when it started life as a Long Distance Walkers Event it is still open to walkers and has a generous cut-off time of 11 hours. Starting and finishing in Haworth the historic centre of Bronte country it promised to be a nice long run in a new place. 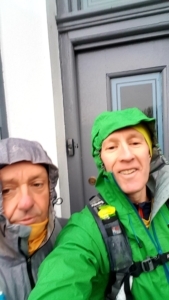 The weather forecast was predicting a cold, wet, windy start improving as the day went on and the walk to registration had been cold but dry. The registration queues were quickly processed and wondering what layers to put on took up the next half hour. Decisions made we set off to walk down to the bottom end of Howarth Main Street for the 8amish start, and as runners milled around it started to rain – waterproofs out. Someone must have said go because everyone started running up the cobbled street toward the edge of town, the moors and Bronte Bridge. 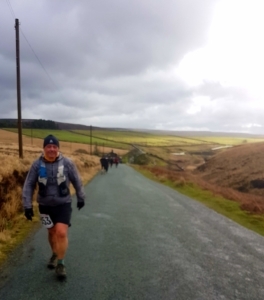 Ahead lay many miles over mixed terrain, including roads, gritstone cobbled paths and muddy trails; I’d opted for my comfortable cushioned Altra trail shoes which are good on most of these except mud. And the rain was making it muddy in places making traction difficult at times. Up on the moors the rain eased off but the wind was relentless, crossing the dam at Widdop Reservoir the waves were sending surf over the top of the wall and gusts at the end of the wall stopped us in our tracks. 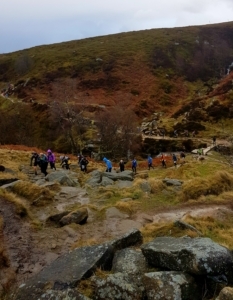 There was brief respite from the wind as we climbed back up onto the moors but as we crested the hill it was back and the hail started, making the otherwise pleasant running a little challenging, but we were still making steady progress. By the time we reached the checkpoint at Stoney Lane the weather was showing signs of improvement and the warm tea and pasties were a welcome treat, hot dogs and sausage rolls were also on offer. 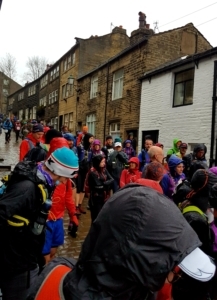 With almost half the race behind us and the weather improving we pushed on towards Todmorden, where it all began to change. 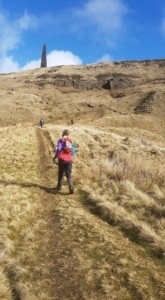 Coming down a steep path in Todmorden I slipped and hit my back on some stone steps, we pressed on hoping the pain would ease but every step for the next 15 miles was painful. Not much further on at the Mankinholes YH checkpoint there was a welcome dram, the last drops from a bottle of Talisker. 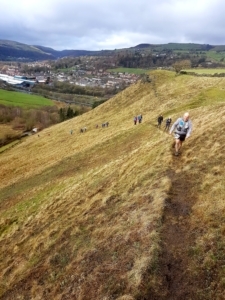 It was warming, if not soothing, and a welcome fillip as we headed for the climb up Stoodley Pike. 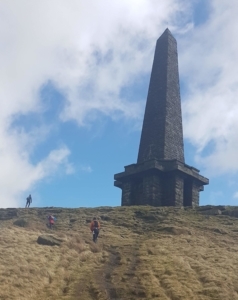 A nice soft descent off Stoodley Pike eased the jarring pain in my back but the descent into Hebbden Bridge down a steep tarmac road was brutal and the climb out to Hepptonstall was a long hard slog. Some of the climbs in the second half of the race are long but the mixture of trails and roads is not hard going but progress was slow with my sore back and JD’s achy knees. One last climb over Penistone Hill before dropping back down to Haworth Main Street. A quick short cut through the doctor’s car park and into the primary school to finish. A welcome hot meal and a can of beer (courtesy of JD) eased my pain into a satisfied stiffness. After a rest we saw on the results that fellow Westie Dave Rogers had completed the race somewhat faster than us, and we hadn’t seen him all day. My perennial race goals were achieved; (1) finish (2) not last. JD (on his sixteenth attempt) got a personal worst – sorry pal. This is a nice friendly race in a beautiful landscape and at £13 (or £22 for a pair) I dare say we’ll be back for another day out next year. Who knows, maybe, we might even do better. The more the merrier Alex.